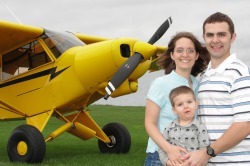 Jeffrey and Bethany, with their son Ezekiel (age 2), are our newest candidates at Compass Aviation Ministries. Jeffrey & Bethany have a heart for lost people who have never heard the gospel, desiring to be a part of the team that helps reach them. Jeffrey has over 100 hours of flight time but needs additional training, including his Instrument rating & Commercial certificate. He also has his Airframe and Powerplant (A&P) mechanic's license and is gaining maintenance experience working/training with us here at Compass Aviation Ministries. Upon completion of his flight and mechanical training they will be well-equipped and prepared for an evaluation with a missionary aviation organization. The Spangs are excited about the opportunity they have to be a part of God's work! Please pray for the them as they receive the training needed to be an effective part of missionary aviation as it helps spread the gospel.